Genes are the segments of DNA which has all genetic information of the organisms. It decides the phenotype of the organism. (Phenotype – external appearance) Inside a gene, the DNA sequence of bases along a DNA strand decides a messenger RNA sequence and this mRNA sequence then decides one or more sequences of protein. Translation rules determine the relationship between the gene nucleotide sequences and the protein amino-acid sequences. This is known commonly as coding of the genes or with the famous term genetic code. Each sequence is denoted by codons. The 3 letter word is the codon which forms the sequence. This genetic code is written as AAA, AUG, ATT & etc. RNA polymerase induces the gene coding to copy in to the messenger RNA or mRNA. Ribosome then decodes the RNA copy and reads the RNA genetic sequence by base-pairing the mRNA to transfer RNA or tRNA which carries amino acids. 64 possible genetic codes are discovered. Because there are 4 bases A T G C in 3-letter combinations. There are 20 standard amino acids are identified. 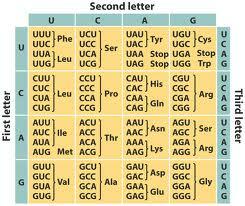 Here this table helps you to understand the amino acids and see, more than one 3 letter code referring a codon. 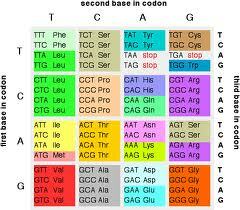 Also you can see in the above picture there are 3 codons are mentioned as Stop Codons. Why? Can you guess? These three codons end the coding regions. They also called as ‘nonsense’ codons. 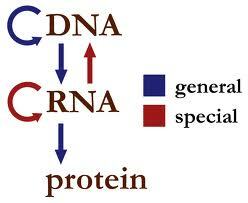 These are the three codons named TAA, TGA and TAG. • One DNA polymerase produces the leading strand copy. • Another DNA polymerase binds to the lagging strand. This enzyme creates the discontinuous segments before the DNA ligase starts its work. That is this DNA ligase always binds the broken nucleotide sequences. For growth of any organism cell division is very important. Because of the cell division only the organism can grow rapidly and get the complete physical structure. But along with cell division, the DNA also should replicate. Then only the genome sequences would be doubled and both the daughter cells will be having same genetic sequences. In the DNA replication process the two strands of DNA are separated and then each strand's complementary DNA sequence is recreated by an enzyme called DNA polymerase. This enzyme helps to complement this strand with the other strand which has the complementary sequences. Want to know more about DNA Translation process? Click here to schedule live online session with e Tutor!